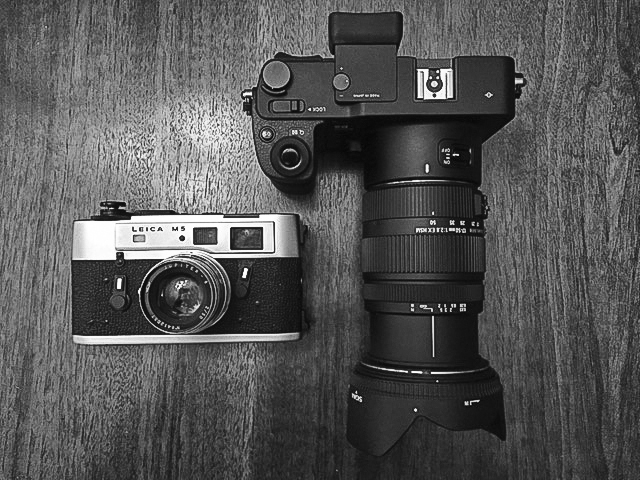 Is the Leica M5 Still “Too Big”? 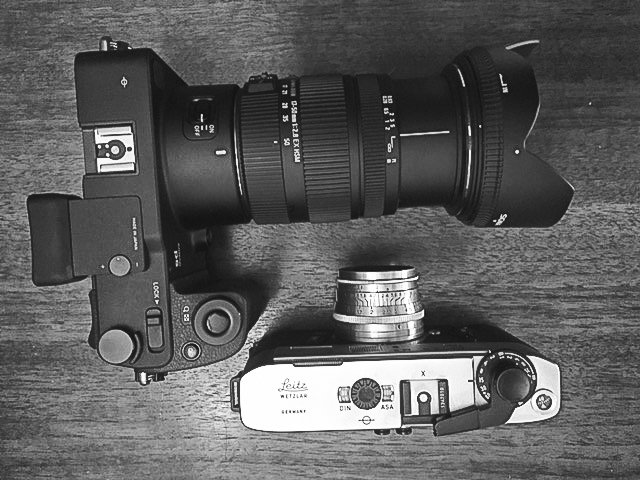 Above is the Leica M5 with a 50mm next to a Sigma SD Quattro with 17-50 2.8 zoom. Probably a bit of an unfair comparison given the Sigma zoom, but in actuality the 30mm Sigma prime – which would be the functional equivalent on the Sigma of the 50 on a 35mm body – is about the same size. The Sigma SD Quattro isn’t considered overly large for a high-end digital (it’s a really interesting camera too, incredible value for what is in effect medium format output) but it dwarfs the M5. The pictures really don’t give you a full sense of how much bigger it is than the M5. I note all this because one recurring complaint about the M5, even today, is its size. I’m convinced most critics who complain of its size havent ever used one but are simply repeating what they’ve heard or read from someone else, that person typically having done the same. My sense is that the original antipathy to the camera was borne of its look – certainly different from the iconic M profile – and most of the criticism justifying the antipathy was what logicians call special pleading (put an M5 next to a Nikon F2 for clarification). This entry was posted in Leica M5 on November 29, 2017 by Leicaphila. I enjoy using my M5. Love that meter! I love the M5. The viewfinder is 2nd to none. The shutter feels and sounds like butter (a detail too few credit the camera with.) But it is a big, bulky and heavy instrument, even with a small summaron lens attached. There is no denying this fact. It’s not a light, versatile camera, the way the M series was first designed to be. It’s a commitment to carry every day. It calls attention to itself in public, I had a convo every day about it with the curious while out and about. That, I think, is the big problem people have with this model, and the reason I sold mine. Discretion is important to me. Still, when serviced and on point the M5 takes the best and most natural pictures with basic color Kodak film of any 35 I have ever shot, film or digital. Interestingly results with Fuji film were never nearly as good, I’ve always wondered if that had something to do with the lenses not reacting well to the strong greens in the superia line. Just found slr cameras far more useful in my work. Interesting comparison photographs! Can you repeat them but this time include a screw-mount Leica instead of the M5? I don’t have a problem with size, weight nor functionality, but the design if of it just seems weird. The bezel on the front is pointless; no space was saved despite the rewind lever being moved to the bottom, the exact opposite in fact, due to battery compartment placement. Not that I’m a purist; for the price these go for they’re an excellent choice, and I was thinking of getting one. Just yesterday I saw pictures of an M6 prototype, which was basically a sawed-off R4 (just about the opposite how the Nikon F was born, heh) with the rangefinder slapped on top. M5 style shutter speed ring, stepped top plate, and (horror!) normal film back door. Too bad they didn’t pursue that one further. Yes, a “normal” back would have been clever; even the Nikon F didn’t get that right: had to pull it off the tripod to reload… but the F2 was sorted. Still, had I been willing to buy a Leica rangefinder back in the day, just as a curio, really, as it wouldn’t have had much actual use, I think I may have clung onto it, where I did not the Nikons, deserting the entire format for a while before going straight back with a sign of relief. Something about that 135 format that just, well, works! Another vote here for the M5. Next to my M10 (which shares dimensions with the M7 and is only a few mm taller than an M3) it looks slightly larger, but not grossly so. I love my M5. I’ve only had it a year, but it has been a great camera to use in that time. I have handled, but not photographed or lived with the more traditional size M cameras, so I can’t really comment on the size, but it fits my hands well.